class="post-template-default single single-post postid-332928 single-format-standard custom-background group-blog header-image full-width singular wpb-js-composer js-comp-ver-5.7 vc_responsive"
Kearney, Neb. 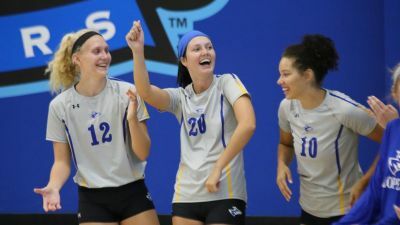 – The Nebraska-Kearney volleyball team is now ranked number one in the latest AVCA (American Volleyball Coaches Association) Division II Top 25 poll. This is UNK’s first time atop the rankings since October 8, 2012, and the 25th time the Lopers have been tabbed as the nation’s number one team. Kearney was ranked eighth in the preseason poll and fifth last week. UNK went 4-0 in its own tourney over the weekend with most of the Top 10 suffering at least one loss. The Lopers tallied 1,142 points and 26 of the 48 first place votes. Two-time defending national champ Concordia-St. Paul (6-2) is second with 1,122 points and 15 first place nods with Northern State third (1,080; six first place). The NSU Wolves, Palm Beach Atlantic (No. 4) and Northern Michigan (No. 23) join UNK as 8-0 teams in the Top 25. Nine Central Region teams are in this week’s rankings. Besides CU and Northern, the other Central squads are Minnesota-Duluth (No. 6), SW Minnesota State (No. 7), Central Oklahoma (No. 18), Wayne State (No. 19) and Missouri Western Stats (No. 25). UNK heads to the “Vulcan Classic” in Pennsylvania this weekend.